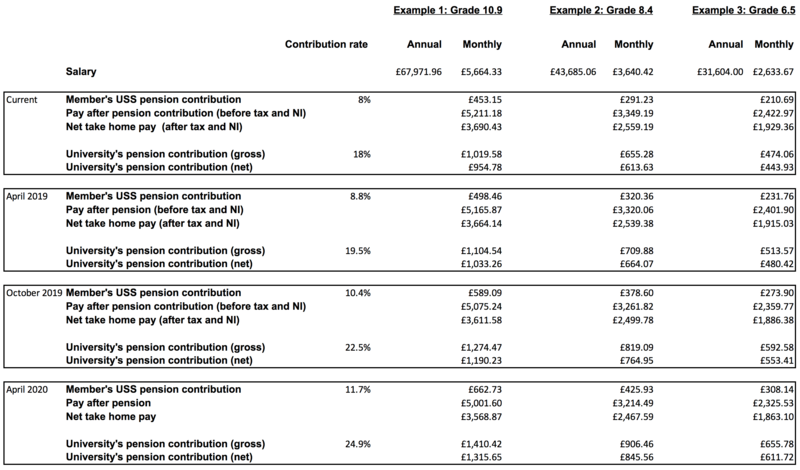 HomeStaffWorking at OxfordPensions commsThe USS proposals – what do they mean for me? The USS proposals – what do they mean for me? The USS pension scheme trustees have now published their cost sharing proposals for phased contribution increases from employers and employees over the next two years. The first increase would be in April next year, with two further rises in the following 12 months. For employees, contributions would first rise from 8% of pensionable salary to 8.8%. Employer contributions would rise from 18% of staff salaries to 19.5% at the same time. The University will consult fully with staff on these proposals from September. The benefits paid out under the scheme remain unchanged. The USS is bringing forward the proposal as it is legally obliged to complete the valuation of the pension scheme by next April. Under the current valuation, the USS trustees believe they need an extra £900 million a year in contributions to maintain the current level of benefits, to make sure future benefits are fully funded and to meet their legal obligations to the Pensions Regulator. Under the USS cost sharing rules (Rule 76.4-8), employers must meet 65% of these increased contributions, and employees the remaining 35%. The USS has phased the increase to give employers and employees more time to prepare, and to allow the UCU and UUK more opportunity to develop alternative proposals. All member contributions are made before tax and national insurance, which reduces the effect on net salary. However, as they stand, the USS proposals would present a challenge for staff and the University. The University’s net pensions contributions are after National Insurance savings and Apprenticeship Levy savings. Under the proposals, the current “employer match” scheme, where employers match up to 1% of top-up contributions made by staff, would be discontinued from April. This reduces the eventual overall contributions required from employers and employees from 37.4% to 36.6%. Further details from the USS trustees on their proposals can be found here. Oxford will begin a 60 day consultation with staff on the USS proposals with staff in September, as it is required to do. Details on consultation sessions and online survey arrangements will be circulated shortly. In the meantime, Council members are available to discuss the USS proposals and answer any questions from employees at the University’s online pensions forum. Meanwhile, the Joint Expert Panel established by Universities UK and the Universities and College Union is continuing its discussions on the USS scheme valuation. The panel is due to report in September and may agree on a different valuation to that in the USS proposal. That valuation could in turn lead to alternative proposals for contributions and benefits later in the year. If agreed, these proposals would supersede those currently made by the USS trustees. The University will keep USS members updated on the Panel’s progress and will consult staff separately on any recommendations which result.